Children with uncontrollable movements, or generalized dystonia, have an option that isn’t widely known: Deep Brain Stimulation (DBS). This surgical treatment (which involves implanting electrodes in the brain) is not new, but it’s also not often considered for kids. One reason is that generalized dystonia in children simply isn’t a very common problem. Those who struggle with it have sustained muscle contractions that cause twisting and repetitive movements or abnormal postures in broad regions of their bodies. For the children who need it, DBS can give these kids their lives back – stopping the uncontrollable movements and allowing them to live a freer life. 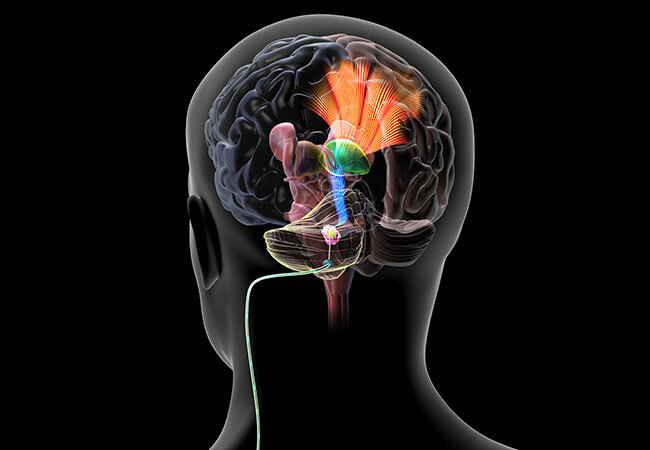 During DBS, implanted electrodes in the brain deliver electrical impulses that block or change the abnormal activity causing movement disorders. The technique is most commonly used to treat adults with Parkinson’s disease and tremor, but it can also treat dystonia and tremor due to neurological disorders such as multiple sclerosis. Andre Machado, MD, PhD, Director of Cleveland Clinic’s Center for Neurological Restoration, describes deep brain stimulation as being “like a pacemaker for the brain.” By modulating the abnormal signals in the brain, DBS helps people with movement disorders. What’s unique about kids with dystonia? Dr. Machado says using DBS to help kids with dystonia isn’t new and has been performed for several years. Children (and adults) with dystonia tend to improve more over time than patients with tremor or Parkinson’s disease. “Plasticity of the brain is likely involved but genetics may also play a role,” Dr. Machado says. Are there other uses for DBS? DBS can help children with other neurodegenerative disorders (often with unknown or “idiopathic” cause) and can treat severe forms of Obsessive-Compulsive Disorder (OCD). Researchers are evaluating if deep brain stimulation can alleviate other disorders, including chronic pain, epilepsy, traumatic brain injury, Tourette’s syndrome and psychiatric disorders. “While most of these are aimed at adults with devastating neurological conditions, some (like epilepsy or traumatic injury) may apply to kids,” Dr. Machado says.